This is a vegetarian pasta dish with amazing aroma and flavor for a speedy weekday meal. In a large saucepan add oil and mushrooms and cook until slightly softened. Add tomatoes, red wine and beef broth and heat until slightly thickened. 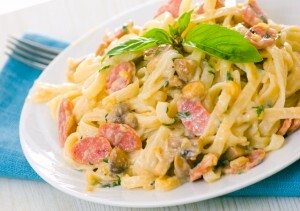 Serve sauce over top cooked pasta and garnish with parmesan cheese.